The Sports Centre was fully renovated in 2015 and now, more than ever, is one of the most stunning high-performance multi-sport complexes in North America. It provides a superior sports experience to the local community, no matter their age or ability. All installations are accessible to everyone, including the gym, pools, dedicated exercise rooms, and café-boutique. The Sports Centre also provides a top-of-the-line training environment for high-level athletes. Various sports clubs hold practices and competitions here. It is both an incubator of sports excellence and an ambassador for healthy living for everyone. Discover the Wibit Sundays experience at the Olympic Park Sports Centre! Every Sunday, a section of the competition and diving pools is transformed into an aquatic playground. 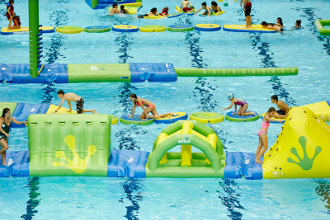 Come run, jump, slide, and swim on water obstacles and inflatable tracks. There are many open swim periods scheduled for adults and children alike, allowing swimmers of all levels to enjoy the sport. Some periods are open exclusively for kids 0 to 6. The Sports Centre also offers the most swim lanes of any facility in Québec. The Sports Centre offers a variety of memberships and packages. Whether you’re looking to train in the gym, take group classes or use the pool, we have the right membership or package to suit your needs. The pool located on the mezzanine was used during the 2005 FINA World Championships. 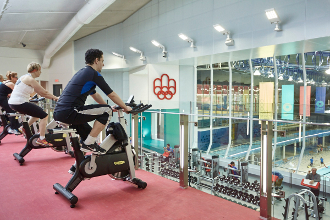 Originally located in Parc Jean-Drapeau in the summer of 2005, this pool was moved to the Sports Centre in 2006 in order to provide high-level athletes with a space to train. Today it is used by the synchronized swimming and water-polo teams. At three metres deep, it meets the most recent requirements for synchronized swimming competitions. A 5-minute walk from Viau metro station (green line) as well as stops for busses 34, 125 and 136. The Sports Centre is accessible to people with reduced mobility, and sanitary facilities have been adapted to accommodate anyone who uses a wheelchair.